This project covered approx 2,100 linear foot in-stream water quality improvement using Regenerative Surfacewater Conveyance (RSC) techniques, for the non-profit 501c(3) Severn Riverkeeper, funded by State and Federal ecological restoration grants. 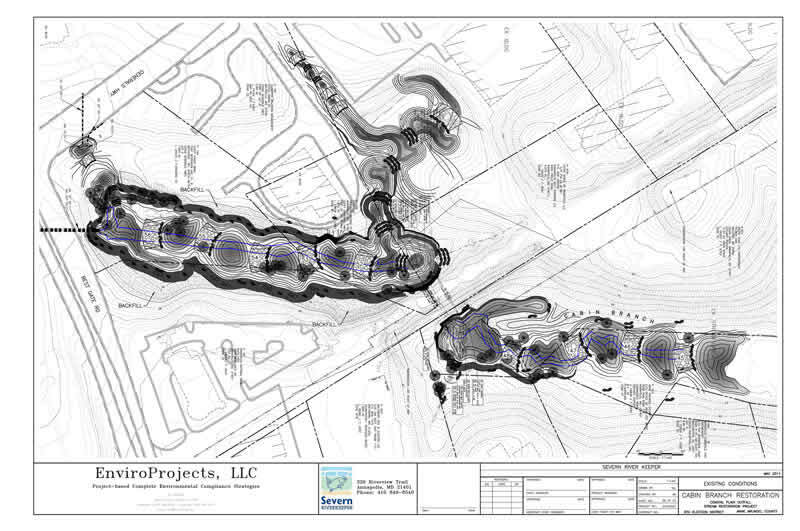 EnviroProjects served as prime contractor, project manager and lead designer for the development of conceptual through final engineering stream restoration design plans, state/federal permitting and County permitting. 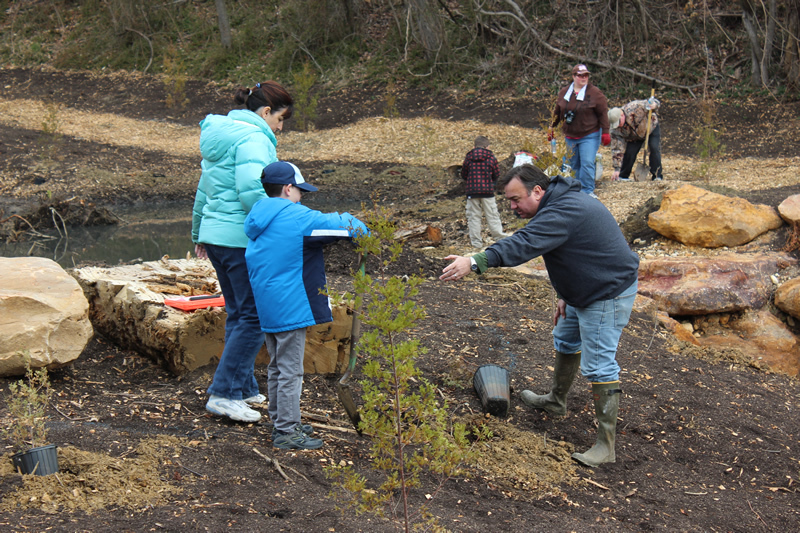 The RSC stream restoration design involves a series of sand and wood chip berm weirs; each providing 1-foot hydraulic gradient lifts and creating shallow pools above the weir. The design creates aggrading riparian stream eco-systems, which slow stream flow velocities and raise the peak flows out of incised eroded channels. Berm wiers are placed in a sinusoidal configuration mirroring natural thalweg patterns and maximizing linear footage. Parabolic sand berms are constructed across the entire floodplain to maximize peak flood conveyance area. and by creating small pools at berms increase upstream fisheries habitat. Parabolic berms are designed to safely convey the 100-Year storm and to spread peak event water surface over the largest area, often are proven to reduce 100-Year FP elevations. The Cabin Branch Stream Restoration project was located at the top of an urban watershed, immediately below a 64-inch RCP storm drain outlet under Bestgate Road. 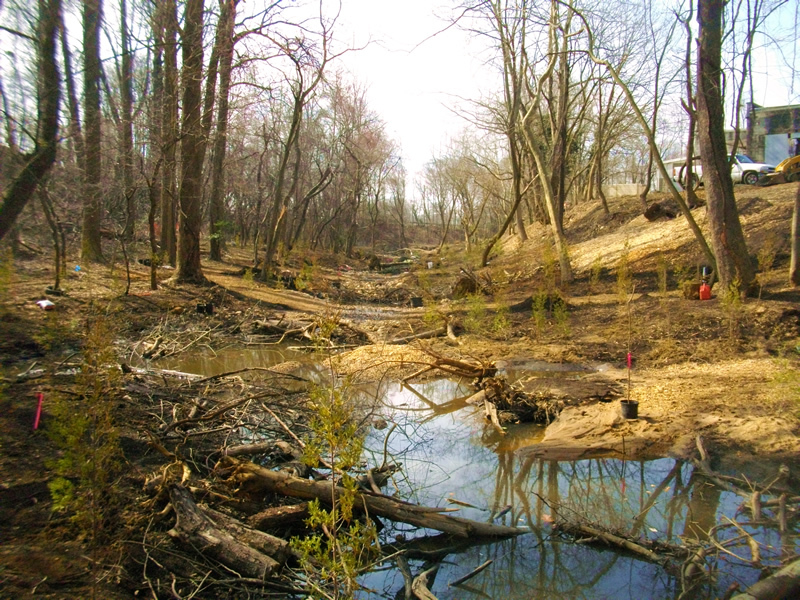 Decades of unmanaged storm drainage from the 80% impervious upstream watershed (including Annapolis Town Center Mall) severely degraded the Cabin Branch stream corridor within the 1,200-foot project area. In addition, the project area was bisected by an a former railroad fill crossing with inadequate sized and improperly constructed culverts, exacerbating the upstream and downstream erosion. EnviroProjects provided budgeting, contract management, construction cost estimates, stream assessment and monitoring design services, successful completion of the US Army Corps of Engineers and Maryland Department of the Environment permit approvals, County grading permits, County code “modification” waivers, Soil Conservation District approvals, wetland/stream delineation, and forest Stand delineation/forest conservation plan. EnviroProjects developed CADD design, topographic and property surveys, and Hydrology & Hydrologic (H&H) engineering studies.